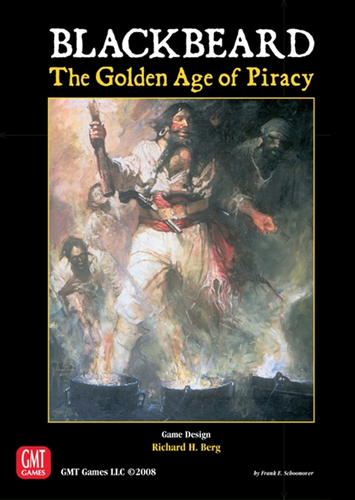 One of the most popular, and successful, Avalon Hill games of the late 1980's was Blackbeard, a pirate game totally different from any others available because it simulated the actual life and careers of historical pirates, and how they went about their chosen professions. Richard Berg has now taken the original and redesigned it, almost entirely, to bring it into line with what gamers like to see and play these days. All those pirates you loved - Black Bart Roberts, Long Ben Avery, Ned Lowe, L'Ollonais, and, of course, Edward Teach (Blackbeard) - 23 in all, are still there, as are the King's Commissioners sent out to stop them. However, the entire play system has been overhauled, and the result is a game that highlights and specializes in player interaction, with almost no down time for any players. Players represent individual pirates, using them to gain Victory Points by amassing booty and, even more importantly, earning Notoriety for their dastardly deeds. Seizing merchants with cargo ranging from useless paper to the monumental treasure of the Mughal emperors, attacking and sacking ports, fighting storms and scurvy, seeking safe haven in infamous pirate ports such as Tortuga and Madagascar, and, hopefully, using Letters of Marque to retire successfully. And while the player is doing this, all of the other players, at the same time, are playing their cards and seizing opportunities to stop the pirates. There is a constant interplay among players, and you never know what is going to happen when you set out to do something. Blackbeard is designed for 1-5 players, along with specific rules for solitaire play. Playing time, as noted above, for a full game has been three hours.